On May 5, 2016 Destany attended the Annual Youth Job Fair held at Lowell High School and was hired by a local ice cream shop. A few weeks later she was offered a job in the Summer Youth Jobs Program at the Career Center of Lowell. She was so excited to have two jobs and start saving money. Mill City Grows, a successful local urban farming program, came to us with the idea of the ‘J-Squad’, a food justice squad made up of young people from our summer jobs program. 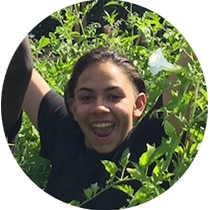 Destany, along with three others, was chosen to be part of the entire Mill City Grows experience and would work each week in all areas of their operation including farming, a mobile food market and community education. The ‘J-Squad’ set out to see how different grocery store vegetables and farm grown, freshly picked vegetables tasted. They conducted several blind taste tests and while they all believed that the majority of people would choose the freshly picked, off the farm vegetables they discovered something different. Rather, people had become accustomed to the taste of store bought vegetables and when faced with the option of the more flavorful freshly picked vegetables, they shied away. The ‘J-Squad’ turned their results into a marketing campaign for Mill City Grows, imploring people to step out of their comfort zone and get back to freshly picked foods. Upon the completion of their time at Mill City Grows the ‘J-Squad’ hosted an event at the Mill City Grows Farm which included a tour and taste test of recipes each young person created from fresh food off the farm. They received recognition from Congresswoman Niki Tsongas (D-MA) for their outstanding work in food justice throughout the summer.